The overview of the projects The Defense of Colored Pencils in 2005. At every project you will find references to other photo-galleries, details of the drawings and more detailed information. 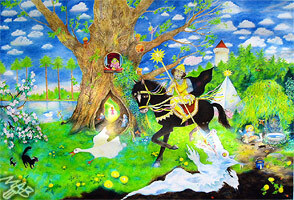 In the Industrial palace in Prague Showground, Marie Brozova created a drawing "The Fairy-tale Forest", that was donated to the children's oncology and hematology clinic in Motol Hospital. The public drawing of this drawing was taking part in the cultural program organized by the Dobry Den Agency accompanying "The Fairy Christmas" fair arranged by Incheba Praha. You could see the record drawing "St. George Killing the Dragon of Winter" created in July 2005 in Konopiste (see below) for the first time at this exhibition that was registered by Dobry Den Agency and included in the Czech Book of Records. The winner of the art contest in drawing with colored pencils was eleven year old Eliska Kolomaznikova from Prague. In the Research Library of Plzen Region, Marie Brozova became inspired by the enervating air of the place and created the drawing "The Book of Life". Thanks to the Library, the project had wonderful publicity that attracted a large number of visitors. Dr. Ivana Horakova, the deputy head of the library, for the active help with arranging the event. Marie Brozova worked in Hradec Kralove, in front of the Sun Tearoom on her drawing, "The Forbidden Fruit" inspired by local art nouveau architecture. Her public drawing was blessed by warm Indian-Summer weather. Marie Brozova created the drawing, "The Warrior Zizka’s Oak" in Zizkovo Namesti Square in Tabor. Jan Zizka was a hero of her childhood, as the warrior who fought against a corrupted Catholic Church in the Middle Ages and never lost a battle. The public drawing culminated during the Tabor Middle Ages Festival, visited by ten thousand people. After more than a year, The Defense of Colored Pencils returned to Prague's Old Town Square, where Marie Brozova first mounted her project. The public drawing of the drawing, "The Sea of Silence" was followed by the exhibition of her drawings and photo-documentation of her traveling project..
"The Sea of Silence" was completed a year later in Pelhrimov, during the Festival of Records and Curiosities. The Defense of Colored Pencils in Jindrichuv Hradec was held under the patronage of the city mayor Karel Matousek, who opened the public drawing with his speech. Marie Brozova drew "The Local Meridian" in front of the Pension 15th Meridian, that was inspired by this beautiful historic city. The public drawing was followed by an exhibition of her drawings in the pension hall and cafe. Pension On the 15th Meridian for the invitation to Jindrichuv Hradec and Ms Lada Cvrckova for immense help with arranging the project. The biggest drawing ever drawn by colored pencils (1189 × 1682 mm) "St. George Killing the Dragon of Winter" Marie Brozova drew in front of the entrance gate to the Konopiste Castle. It was registered by Dobry Den Agency in the Czech Book of Records. Guinness book of records in London asked for the documentation of the project. Marie Brozova opened her exhibition in the Good Tearoom in Jungmann Square in Kutna Hora. Ondrej Smeykal playing the didgeridoo accompanied the opening day. In July, from 9th until 17th Marie Brozova worked on the drawing, " The Light Deep Down in the Earth" inspired by the mysterious world of silver mines in Kutna Hora. The public drawing took place in front of the Corpus Christi Chapel near the St. Barbara Cathedral. Besides drawing, there was a large exhibition of drawings in the Chapel visited by tourists from all around the world who easily understand her work, because it speaks a universally comprehensible language. Marie Brozova drew in the historical Masarykovo namesti Square in Trebon,a drawing titled "Watersprite’s Household" despite bad weather with snow, rain and a hailstorm. The Defense of Colored Pencils took part in the International Festival of Animated Films AniFest 2005. In Prague Letnany Shopping Center the exhibition of Marie Brozova’s drawings decorated the virtual cafe on the Mother’s Day. The cultural program was led by actresses Kveta Fialova and Nada Konvalinkova. Close view of the drawing – "Music"
Czech town Pisek invited the project Defense of Colored Pencils into the Municipal Library, where Marie Brozova created in public drawing titled “The Moon over the River” inspired by this beautiful city. Marie Brozova was very warmly accepted by local people and after her project claimed: "My South-Bohemians understand me." whole Kunik family for lodging during the project and thanks to all the librarians in Municipal Library, who created wonderful atmosphere for the public drawing. Thanks to the invitation of parish priest Jan Kunik, Marie Brozova exhibited her drawings in Chotoviny Church and made a small show of public drawing in Chotoviny parish afterwards. parish priest Jan Kunik for arranging the unconventional public drawing and exhibition.